Take the Washington Wizards off the dwindling list of National Basketball Association teams playing without a jersey patch sponsorship in place. The Wizards, along with the WNBA’s Mystals and the NBA G League’s Capital City Go-Go, will now feature jerseys with GEICO’s logo. The Wizards will unveil their new GEICO sponsored jerseys for the first time on November 2 against the Oklahoma City Thunder. 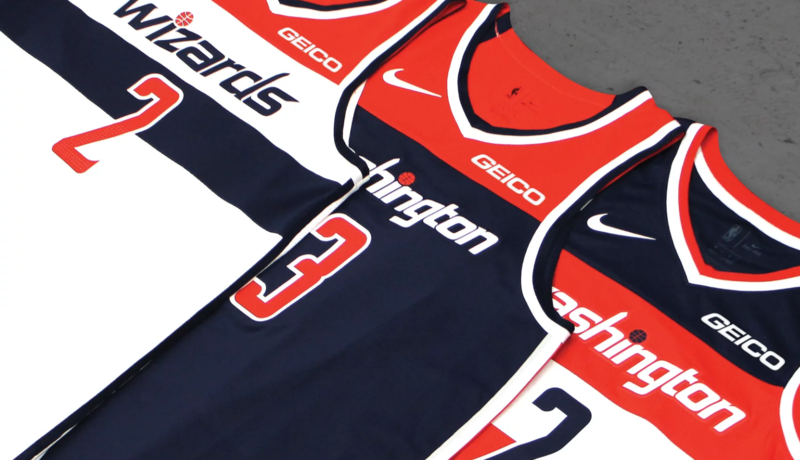 The Geico logo will be much more prominently feautred on Mystics and Go-Go jerseys than Wizards jerseys, with the Mystics jerseys strongly showing the logo. Interestingly, the deal makes GEICO the first brand to have a jersey sponsorship of an NBA, WNBA and G League team. The jersey sponsorship of the three Washington D.C.-based teams is part of a multi-year deal between GEICO and Monumental Sports & Entertainment. The two companies have been partnered for over twenty-five years. “We’re excited about the national platform this jersey patch sponsorship gives us and the opportunity to continue to contribute to the improvement of the community we call home,” says GEICO CEO Bill Roberts. The only NBA teams that have yet to sign a jersey patch sponsorship are the Oklahoma City Thunder and the Indiana Pacers. One of the last NBA teams to sign a jersey patch sponsorship was the Chicago Bulls, which came to a deal with Zenni Optical.